Since I had two card bases completed thanks to yesterday's blog post, I couldn't resist making them into cards early this morning to share with you. The tutorial for the Crinkle Background can be found by clicking here. It's fun to see how many different ways you can make a card using the same elements and color scheme. Lots of rain here in AZ since last night. Yesterday we could even see some snow on the mountains that surround the valley here. Hope you are all having a wonderful weekend. Just a reminder that the Sale-A-Bration promotion ends at the end of March. Don't miss out on earning free gifts with each $50 purchase (before tax & shipping) you make between now and the end of March. I thought it would be interesting to show you two card bases each done using the same colors and technique, but look different because of the pressure used when dabbing the colors/Saran Wrap. In the photo above, I used the Crinkle Background technique (click here for tutorial) . The card base on the left was lightly done and the one on the right was created using more pressure when applying the colors. Classic Ink Colors used were: (all "In Colors" from Stampin' Up!). Sale-A-Bration just has 1 more month to go. Don't miss out on earning FREE items by purchasing Stampin' Up! products. For each $50 in Stampin' Up! merchandise purchase before shipping and taxes, you earn 1 FREE gift from our Sale-A-Bration catalog. There is NO limit to the number of free gifts that you can earn. You can order directly from my Stampin' Up! website or by contacting me. Can't wait to share this tutorial for you. 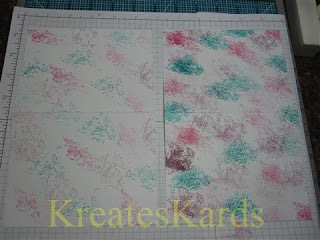 It is such an easy way create your very own unique background using Saran Wrap and 3 stamp pads. Thank you Beate Johns for introducing me to this technique. Saran Wrap --- take 3 sheets (about the size you would cover an apple easily). Wad the Saran Wrap into a ball and place one on each ink pad. You don't want to intermix these. So one piece per color. Ink Pads -- any 3 colors will work. Pick a light, a medium shade, and a dark shade. Open your white card stock (5 1/2 x 8 1/2) scored at 4 1/4". Ink the Saran Wrap by dabbing on the Pretty in Pink Stamp pad. Now dab on the card stock in a random pattern. Now do the same with the medium color (Pale Plum). And next do the same with the Perfect Plum. You will be amazed at all the patterns/designs the Saran Wrap will form. I did the same stamping on a smaller piece of paper (4 1/4" x 2 3/4"). 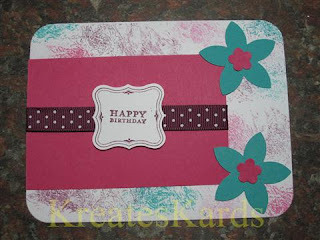 To finish off each piece I used a sponge to accent the edges of the card stock with Perfect Plum. I used the Vintage Labels stamp set to create the design above, then accented with the sponge and perfect plum. The design was punched out with the Wide Oval Paper Punch. Using approximately 5 1/4" of Pretty in Pink Satin Ribbon, set it across the smaller piece of card stock. Put 4 dimensionals on the back and then attach to the card base. Using Snail Adhesive, attach the oval to the ribbon. Your card is now complete. Hope you will try this new technique. More and more people are using their Stampin' Up! Big Shot Die Cut Machine for more than paper crafting ... they are using it for quilting!!!! This machine is so versatile. 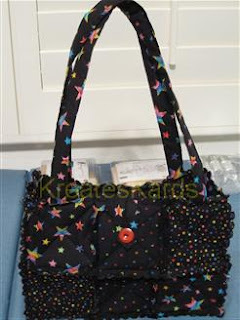 Above is a photo of the quilted rag purse I made. At a recent leadership conference here in Phoenix, demonstrators were given framed quilt blocks that used the 5-Point 3D Star BigZ Die (item #113473). The following link will give you a photo PLUS full directions on how to make this beautiful quilt block. I had so much fun making the rag purse using my Big Shot, that I have purchased more material to make a tote and hope to make a full size quilt soon. It is so easy with the Big Shot. We were just notified that the following products are still available. They had premiered in our Holiday Mini Catalog. You can add them in to any on-line order or just let me know if you place an order over the phone with me, if you would like these added in. In addition, these products will be available in the next Idea Book & Catalog that will be effective as of July 1, 2010. Isn't that great news!!! Each Monday, I will be posting a challenge to you. It is intended to help you find inspiration. You can also participate thru my Facebook page if you would like to join in. This week's challenge is to use the color black. It does not have to be the primary color, it can be the accent color. I hardly use black at all. Today while surfing the internet I saw a beautiful card that was light pink and black. I know I would have to try to make a card too with a black accent. Hope you will decide to join in too. There is no time limit on this challenge. Join in at any time. New challenge will be posted next Monday. UPDATE 4 pm: Just added in my challenge card. Hope you like it. Happy Valentine's Day Everyone. Hope your day is filled with many wonderful surprises. 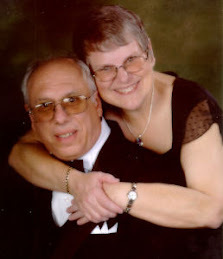 I just created a Facebook Fan Page and hope your will join in as a fan. The Facebook page will show any time that I update my blog, and have some unique content also pertaining to paper crafting and Stampin' Up!. It WILL NOT be replacing my blog here, but will compliment my blog. This is a min-tutorial. So will not have step-by-step photos and directions. Wanted to give you inspiration tho and hope you will try this. I got my inspiration from a similar card made by Tina Lesson. I used the Scallop Trim Corner Punch (item #118870) only on the corners of the base, red piece, solid black, and black print piece. For the white solid piece I used the Scallop Trim Border Punch (item #118402) which is found in the Sale-A-Bration Catalog. Sentiment is a new Level One Hostess Gift called Picture This (item #116928 for wood mount and item #118538 for clear mount). Hostess Gifts are earned and cannot be purchased outright. Any order with a minimum of $150 would qualify for a Level One Hostess Gift and Picture Perfect is just one of the things to choose from. It is shown in the Occasions Mini Catalog. This is the inside view of the card showing the side with the scallops. This is a close-up of the corner and the black accent. Any coordinating paper may be used for this style card. Be creative, try something new. I went thru my stash of papers when I made this card, and am very pleased with the results. I hope you will try this card style too. Product reviews I believe are beneficial to both you as my customer and to me as a demonstrator. It allows me to focus on a specific product with you and outline some of its highlights. When I first started as a demonstrator back in August of 2008, my dream was to have one of each classic ink stamp pad that Stampin' Up! made. I was amazed at how quickly I added to my collection, and the need for storage became obvious. Stampin' Up! to the rescue. 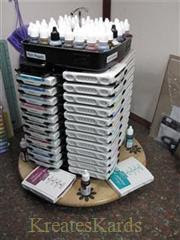 The Color Caddy holds 48 Classic or Craft ink pads and 48 refills and even rotates. There is some assembly required (just remember to NOT tighten the handle too tightly as you can strip the threads). The Color Caddy pictured above is mine and I have put it on an oak lazy Susan (turn table). I decorated the lazy Susan with Decor Element daisies. This gave me additional storage area that would also turn. 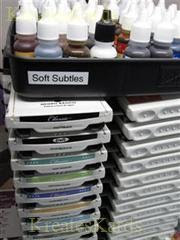 The Color Caddy does turn using its handle, but I have found for me that the lazy Susan makes it easier and smoother. There really is quite a bit of weight with a full Color Caddy. I added in labels that I made to identify the color groupings. The refills are stored in the top area which is divided into 4 areas also. Great way to keep things handy. I had a few more items than the Color Caddy would hold, so decided to store them this way for now. I have 8 Decor Elements daisies on the turn table. Some are hidden by the products, but you can see one under the Bermuda Bay refill. There is also a Color Caddy Extender Kit available. It is item #107063 and sells for $14.95. The extender includes 3 stacking trays to accomodate 12 additional Stampin' Up! ink pads. Comes with extender rod and assembly instructions. NOTE: You can only use 1 extender kit maximum with the Color Caddy. I have not purchased the extender kit as my Color Caddy sits under a built in cabinet and the extender would make it too tall to fit. I would highly recommend the Color Caddy. It is a great product for organization and ease of use. 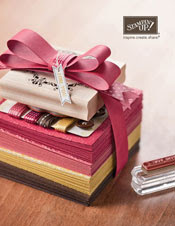 During Sale-A-Bration, the purchase of the Color Caddy would entitle you to one free gift from our Sale-A-Bration catalog. If you have any questions or would like to place an order, please contact me OR go to my on-line Stampin' Up! website to place your order. Last week while blog surfing I saw a flower bouquet made by Andrea Walford that gave me inspiration for my bouquet. As a result I knew you would love to see how to make these gorgeous flowers too, so tonight I got busy and created a tutorial for you. The vase is filled with iridescent marbles and the flowers are on wood dowels that I purchased at a local craft store. The center of the flowers are chocolate hearts (Reeses & Hershey) but any round, square or heart would work as long as it will fit the center of the flower. This way you can give flowers and chocolates in one gift ... talk about PERFECT!!! This is the finished bouquet. With a larger vase, more flowers would work too. I tied a ribbon about the vase and accented it with a glittery heart. These would also be perfect on the front of a card or the top of a package. Real Read Card Stock -- item #102482 -- 2 pieces 5 1/2" x 5 1/2"
Pretty in Pink Card Stock -- item #100459 -- 1 piece 4 1/2" x 5 1/2"
Whisper White Card Stock -- item #100730 -- 1 piece 4" x 4"
Old Olive Card Stock -- item #100702 --1 piece 2" x 5 1/2"
If you are making the bouquet, be sure you have 2 sheets of real red for the flower. If making a card or accent to a box only 1 piece is needed. Punch out 3 large ovals for your leaves. Accent with the Stampin Write Marker. I used Old Olive to draw in the veins of the leaves. There are actually 4 flowers on the Flower Fold, we are only going to use the 3 larger ones. I found that if I laid the paper out making sure that all the flower petals were covered that I could cut 3 at a time. You will end up with small fragments of petals that can be thrown away .. this happens because of the overlap. Remember because of the petal folds do not cut both pieces of red at one time. Now cut out your last piece of red paper for the largest flower. Here's your finished 4 flower parts. We are going to emboss both the pink and the white flower part to give texture to your flower. The red flowers are a bit too big to put in the folder so will remain plain. Alignment of the petals is important when assembling this flower. Put 2 large Pop-Up glue dots on the flower base. Firmly press in the dowel. Do not put the end of the dowel higher than the fold line in the flower. Taking the 2nd red flower do the same thing and attach it to the other side of the dowel. Remember to line up the petals so they are behind each other, not staggered. Using Sticky Strip attach the white flower to the pink being sure to line up the petals. Sticky Strip is recommended because of the weight of the chocolates. Using Sticky Strip on the back of the chocolate, attach to the very center of the flower. Attach the pink/white/chocolate center flower to the red flower using Sticky Strip. I put small pieces of sticky strip on the ends of the leaves and attached them to the dowel. The following are photos of the finished bouquet. I'm so pleased with it. I hope you will try this tutorial too. It would be perfect for a Valentine's present. Wouldn't it be a great centerpiece too at a bridal shower. So many possibilities. If you have any questions, please let me know. If you need any Stampin' Up! products, you can contact me directly or order thru my Stampin' Up! on-line website. It seems impossible that Valentine's Day is just 1 week away. Are you ready? Have you picked out the perfect card? Remember you can make the card yourself and make it even more special. I'm going to showcase two cards today with just brief information about them. I will have a new tutorial posted tomorrow or Tuesday. Still working off the laptop as my new computer is not ready for pickup yet. Hal's cousin has a birthday on Valentine's Day so the first card is for him. This card used both the scallop trim corner punch and the scallop trim border punch. Don't you love how they look together. The only way you can get the scallop border punch right now is thru our Sale-A-Bration catalog .... it's one of the free items you can choose from when you place a $50 order (before tax & shipping) from our main catalog or from the Occasions Mini Catalog. 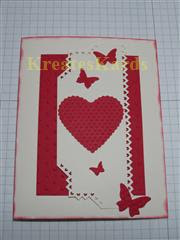 The textured hearts were created using the Stampin' Up! Embosslits Die that is exclusive to us. It is in the Occasions Mini Catalog and is item #117332. It cuts and embosses all at the same time. LOVE IT. 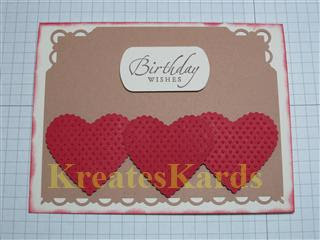 This card uses the pinking hearts paper punches (both corner and border) from the Occasions Mini Catalog. Great way to accent a card. Also used the heart of hearts embosslits PLUS the Stampin' Up! Perfect Polka Dots Textured Impressions Folder (item #117335) and Stampin' Up! 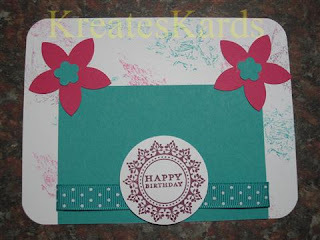 Embosslits Die called Stampin' Up! Beautiful Wings (item #118138) for the butterflies. It is amazing how you can change the look of a card just by adding in a border punch or corner punch or an accent like the butterflies and hearts above. The cards I made above were all made from scrap pieces I had in my craft room with the exception of the card bases. Don't hesitate to try the leftover pieces, you will be amazed at what you can make with them. Scallop Trim Border ... item 118402 ... only available thru Sale-A-Bration promotion. My brand new computer bit the dust, so we returned it and my new one won't be ready till Sunday or Monday. So I won't be updating my blog till next week. It's just too hard to do on the laptop for me with not having a regular keyboard to use. I will be back posting soon. I'm still checking e-mails twice a day, so e-mail me with any questions. I do a lot of blog surfing and reading/viewing on official Stampin' Up! websites. I always want to learn new and creative things that I can pass on to all of you and also teach in my classes. I really think these flowers are going to be one of my favorite creations (thank you again Mercy Kerin for showing me how to make them). 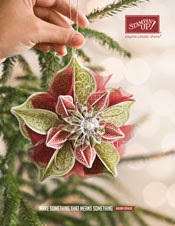 The two middle flowers were made using 1 piece of holiday themed designer series paper from our main catalog. The paper is called Merry Moments, item #1156672. The top and bottom flowers were made from 1 piece of paper from the Designer Series Paper Stack - Sweet Pea, item #117161 and is in the Occasions Mini Catalog. The paper stack 2 pages each of 24 double-sided designs that are 12" x 12". What a great value. Designer Series Paper Stack - Sweet Pea, item #117161 - use 1 sheet 12" x 12"
All ready to go ... 1 sheet of 12" x 12" paper, plus the Scallop Circle Punch. Using the Scallop Circle Paper Punch, punch out 10 scallop circles. Set them all facing with the same designs facing up. Start making random folds in the scallop circles until you have them as tiny as possible. When complete unfold the pieces of paper. The folding helps to break down the paper fibers giving your flowers texture and flexibility. Stack the ten scallops circles on top of each other, randomly placing the scallops but keeping the circles as centered as possible. Using your paper piercing tool and the mat pack (foam piece with hard mat on the bottom), pierce a hole in the very center of the scallops circles being sure to go all the way thru all 10 layers. Keep all 10 layers tightly together as you push thru the brad and secure it. You will find that the mid-size brads works really well with this technique rather than the smaller size standard size brads. The above two photos represent how you will fold and bring in each layer. Work each of the 10 layers one at a time, folding and crimping as you go along. As you work, you will see the flower start taking shape. It does become a bit more difficult to fold and crimp as you get to the bottom layers, but it is doable. When you finish, you can leave the flower as is or gently open the layers to give a fuller blossom. These flowers have dimensions to them and definitely would need a padded envelope if you were going to put them on a card. I think they would look magnificent as an accent to a gift box or bag, the top of a container or added to a journal. If you want to give them a bit more glitz, spray them with the Shimmer Mist (click HERE for the tutorial).